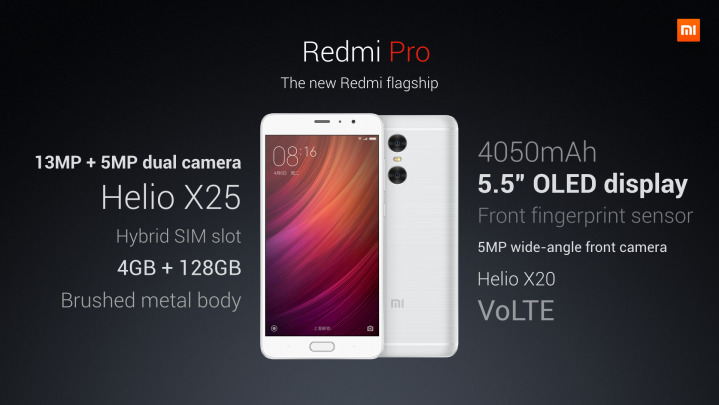 Xiaomi has officially revealed the Redmi Pro smartphone - the Chinese company's most powerful Redmi flagship. 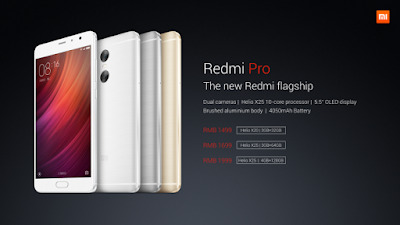 The new Redmi device is crafted with brushed aluminium body, measuring 151.5 x 76.2 x 8.15 mm and weighs at 174 grams. 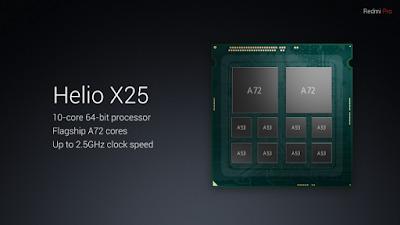 Under the hood, the Redmi Pro is powered by a 64-bit MediaTek's Deca-core Helio X25 processor clocked up to 2.5 GHz and paired with Mali T880 MP4 GPU. RAM options include 3 GB and 4 GB, while internal storage options comes in 64 GB and 128 GB. The main highlight of the Xiaomi Redmi Pro is the rear dual camera setup, featuring a 13 MP main shooter and a 5 MP depth sensor. 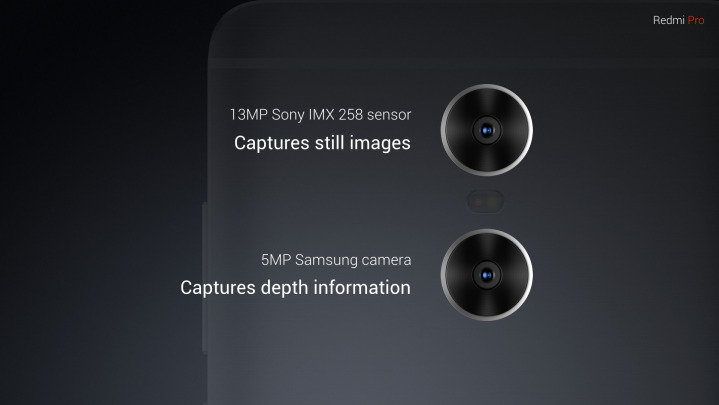 The 13 MP main camera used a Sony IMX 258 sensor while the secondary unit is a 5 MP Samsung camera. The 13 MP + 5 MP dual camera come with an f/2.0 aperture, support phase detection autofocus (PDAF) and there's a dual-tone LED flash between the two lenses. The company claimed that the dual camera are capable to create DSLR-quality bokeh effects. 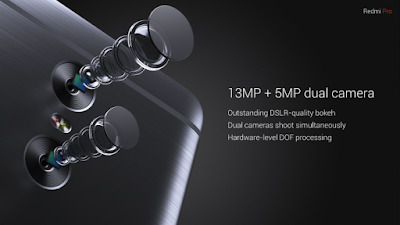 There's also a 5 MP selfie camera with f/2.0 aperture and 85-degree wide-angle lens. 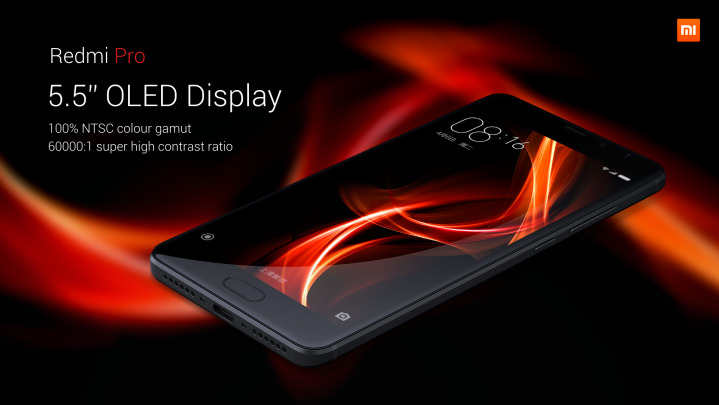 Other than that, the Redmi Pro also features a 5.5-inch 1080p OLED display. The phone's display has 100% NTSC colour gamut and 401 pixel per inch (ppi). 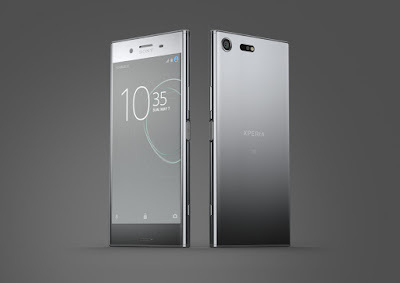 Other specs included a USB Type-C port, a front fingerprint reader, dual-SIM support with hybrid slot, Bluetooth 4.1, Infrared sensor, 4G+ connectivity and a built-in 4,050 mAh battery. As usual, the retail price of Xiaomi's smartphones is their major selling point, the same goes for the Redmi Pro. 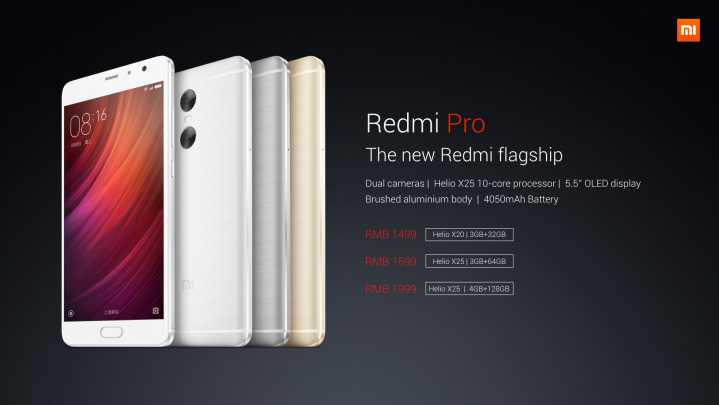 The Redmi Pro starts at 1,499 Chinese Yuan (about RM910) for the Helio X20 model with 3 GB of RAM and 32 GB of storage. The Helio X25 variant with 3 GB of RAM and 64 GB of storage costs 1,699 Chinese Yuan (about RM1,030), while the highest-end version with a Helio X25 CPU, 4 GB of RAM and 128 GB of internal storage will retail at 1,999 Chinese Yuan (about RM1,212). 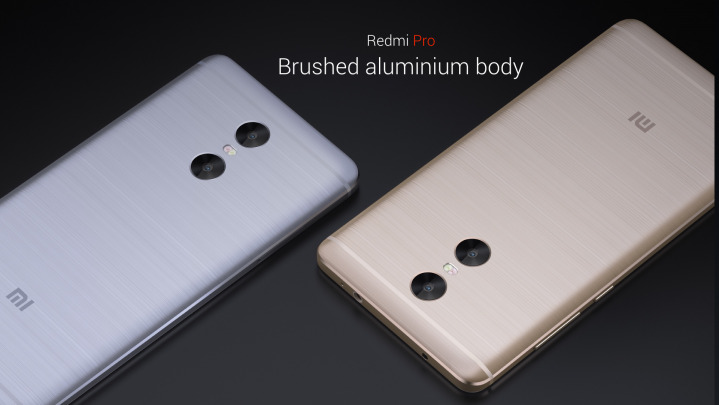 The Redmi Pro will be released in China starting from 8 August 2016 and available in Silver, Dark Grey and Gold.